A wonderful place to see and explore Chaing Mai has something for everyone. Find things to-do. Chiang Mai International Airport (CNX) is the major gateway to Northern Thailand and points further, and soon to be a Thai AirAsia hub. This makes Chiang Mai Airport the logical and convenient pick-up point for your Chiang Mai car rental. Picking up your car could not be easier at the airport, as you just exit the departure area and head on over to our counters. Then, it’s just a quick 10 minutes into town by way of the Chiang Mai Hang Dong Road once you leave the terminal area. Start your search now for cheap deals at Chiang Mai Airport, from the top Thai rental providers — fantastic rent a car deals are just a search away. Chiang Mai car rent from CarHirePhuket.com includes all taxes and airport fees, you’re covered by First Class Insurance, there are no hidden charges when renting from us, and our location right at Chiang Mai Airport can’t be beat! Chiang Mai International Airport (CNX) is where over 1 million passengers a year disembark into the beautiful city nestled within Thailand’s tallest mountain range and along the banks of the Ping River. Ever so modern, Chiang Mai attracts tourist, business people, and increasingly, I/NGO workers. In ancient times, the city was once heavily fortified with a moat and defensive wall, as Burma was a constant threat, and the city was actually abandoned between 1776 and 1791 because of this struggle. Now Chiang Mai rivals Bangkok as a hub for shopping, business, and educational opportunities. And because of its location within the mountains, the Chiang Mai area is also a favorite for wildlife enthusiasts and nature lovers alike. 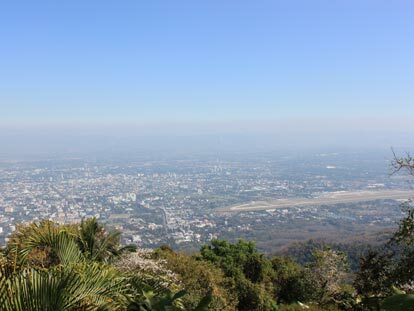 in the adjacent image you can see Chaing Mai city with Chiang Mai International Airport to the right-center. 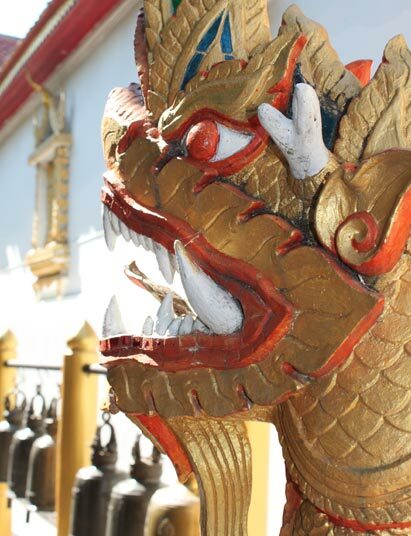 This picture was taken from Doi Suithep Temple, a must-see for any visitor to Chiang Mai. As a modern and dynamic city, you will find loads to do when visiting Chiang Mai – for any reason and with any interests — Chiang Mai has something for everyone. For nature lovers there are the nearby national parks of Doi Inthanon, Doi Pui Suthep and Obkhan. These parks all offer peaceful and unspoiled mountain trekking and recreation areas, to include cascading waterfalls and hidden Buddhist temples scattered amid the hills. For animal lovers, there is the Elephant Nature Park, which is about a 1-hour drive north of the city, and home to over 60 rescued elephants. You can visit the park as well as stay and volunteer to care for these pachyderms that were rescued from lives of hard labor. For coffee and tea lovers, there are the Plantations of Mae Kon Phong to visit, as well as a new zip-line tour inside the rainforest canopy that takes about 3 hours to complete. And for those that love the nightlife, you will find Chiang Mai to be a more relaxing scene then found in Bangkok. Here the bars, discos and live music venues are spread out along Loi Kroh Road and near the walk-in Family Arcade of the Imperial Mae Ping Hotel. 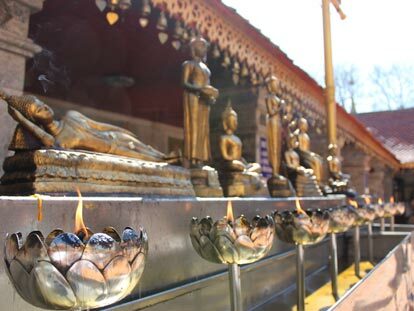 One of Thailand’s most famous temples, Wat Doi Suthep overlooks Chiang Mai City from its spectacular mountain location. About 50 minutes drive from the city, the approach to the temple includes many waterfalls and occasional view-points from which to look down at the city. The temple itself enjoys a impressive and imposing position overlooking the city and area, and its distinctive gold gilded Chedi and marble–floored courtyard is usually a hive of activity with visitors both local and foreign. Certainly a must-go attraction, and well worth the drive. The temple is open daily from 06.00 to 18.00, and admission is free for Thai residents and 30 Baht for foreign visitors. Visit official Doi Suthep website: DoiSuthep.com (some English with Thai). 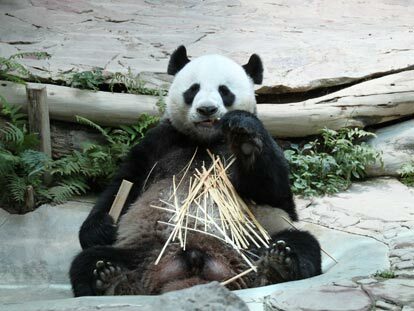 Chiang Mai zoo has become famous for its large panda enclosure, where a large number of the cute furry animals are on display. Enjoy a fun day wandering through the many zones within the park, which also incorporates Chiang Mai Fresh Water Aquarium. Open all year round.